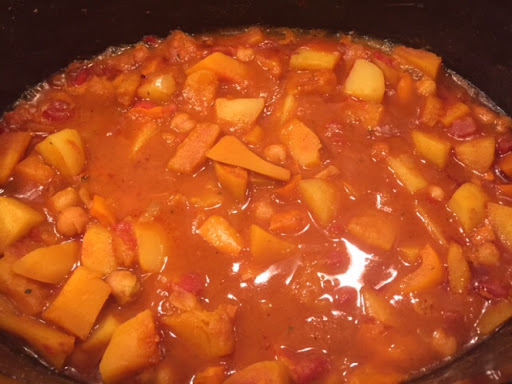 Slow Cooker Vegetable Curry- a low calorie,vegan and gluten free curry packed with veg for a filling meal- butternut squash, potato, peppers and chickpeas. It makes a really healthy meal. Low syn on Slimming World and 217 calories. 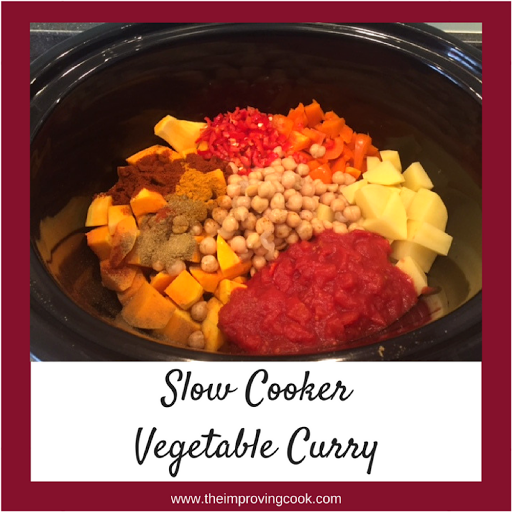 This week I have been making vegetable curry in my slow cooker. I love everything about having a curry- all the trimmings that are involved. Naan bread in particular is a hot favourite for me. I would rather have curry and Naan than have curry and rice. If you like a really fiery curry, often a vegetable curry is the way to go. The veg absorbs a lot of the heat from the spices and really packs a punch! 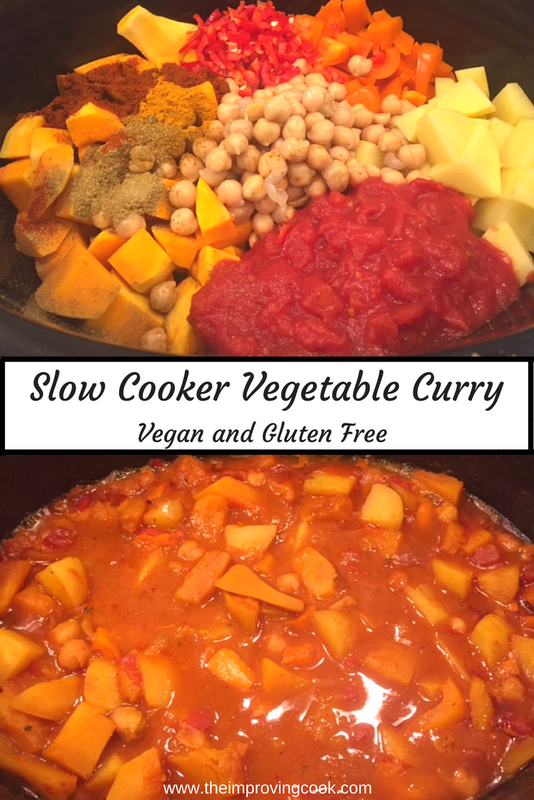 The advantage of using the slow cooker (apart from the usual bonus of leaving it to do its thing) is that it keeps the curry lower in calories because no curry paste or oil is needed. Add that to the fact that veg and pulses in themselves are packed full of nutrients and protein, and you're on to a winner all round. It's also accidentally (as in I didn't plan it that way) vegan and gluten free. For this veg curry, I used butternut squash, potato, chickpeas, orange pepper, onion, coconut milk and plenty of chilli! You could adapt it by adding or swapping out your favourite veg. Cauliflower would be a lovely one to include. I made this version quite spicy by using fresh chillis and chilli powder, but you could swap that out for a mild chilli if you prefer less heat. Make a big batch today and have it for lunch the rest of the week. If you are following Slimming World this is a 1 syn vegetable curry if you use Alpro light coconut milk. Other light coconut milks are 3-4 syns per portion. Looking for another Vegetarian Slow Cooker recipe? For a printable recipe card with full instructions, go to the end of this post. 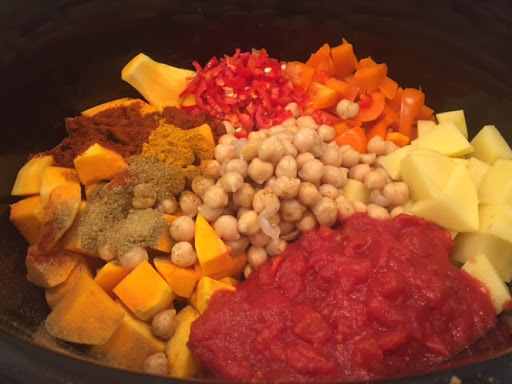 Slow Cooker Vegetable Curry- a low calorie curry packed with veg for a filling meal- butternut squash, potato, peppers and chickpeas. A really healthy, low-calorie meal. 1. Peel the butternut squash and chop into medium chunks (5-6cm). 2. Peel the potato and chop into small chunks (4-5cm). 3. Add both to the slow cooker. 4. Chop the onion and the orange pepper into small chunks and add to the pot. 5. Tip the chopped tomatoes in. 6. Rinse and drain the chickpeas and tip those in too. 7. Add all the spices and chop the chillies finely and add, if using. 8. Shake the can of coconut milk well, open and pour into the pot. 9. Make the veg stock and add that as well. 10. Give everything a good stir and season with a pinch of salt. 11. Cook on low for 7 hours or medium for 6. If near the end of cooking, you think there's too much liquid, move the lid slightly to the side for the last half hour. Serve with rice and/or naan bread. 1 syn per portion on slimming world if using Alpro Coconut Milk, 3-4 syns using other coconut milks depending on the brand. Worried about the heat? If you prefer your curry mild, only use the chopped chillies OR switch the hot chilli powder for a milder one. Are you serving this curry up to people with a variety of tastes? Provide some plain yoghurt to swirl through to make the curry milder. Slow Cooker Leek and Potato Soup- a simple recipe for classic leek and potato soup made in the slow cooker. Syn Free on Slimming World and under 300 calories. It's been a busy week with parents' evening and my birthday, so not much time for cooking! But today I made a gorgeous slow cooker leek and potato soup with one of my birthday presents. It was a new Morphy Richards slow cooker and I love it. I haven't made leek and potato soup very often at home before, but I'm always drawn to it, if it's on offer for a restaurant starter, and I do occasionally buy tins of it. There's something very comforting about eating it. The advantage of slow cooking the soup is of course the convenience, but also that you don't need to use any butter. 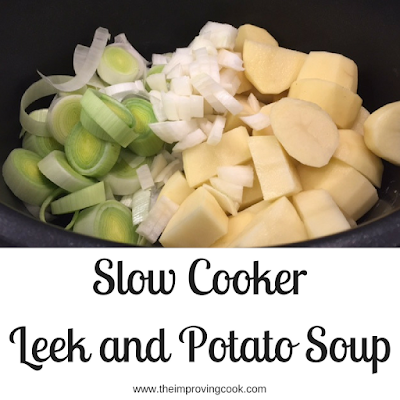 It makes a nice thick, creamy leek and potato soup that keeps really well in the freezer. A definite winter warmer. 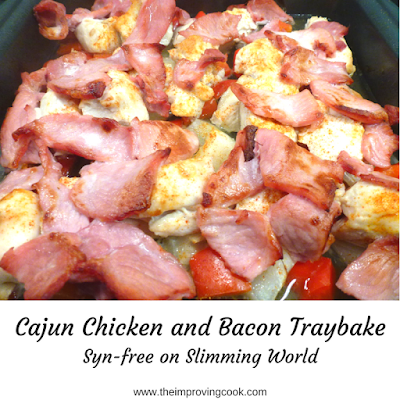 If you are doing Slimming World, this recipe is "Syn" free. Cajun Chicken and Bacon Traybake- a quick and easy recipe with roasted potato, red pepper and onion, perfect for quick weeknight dinners. Syn-free on Slimming World and under 500 calories. The trouble with being on diet plans is that you need to be organised. No getting in from work and thinking what shall I have for dinner, I can't be bothered to cook, let's get take-away! It all needs to be thought of in advance. So, it was a bit awkward last week when we were just getting started and I found myself without any planned dinner. It needed to be quick and fit in with Slimming World for my husband's diet. 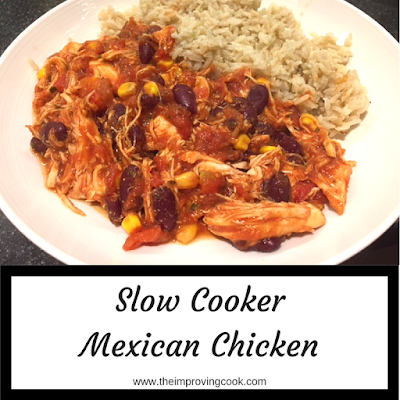 Slow Cooker Mexican Chicken- a spicy, slow cooked chicken dish, perfect for family meals and cooking in large batches for the freezer. Syn free on Slimming World and under 500 calories. I am not affiliated with Slimming World in any way. All syns are correct at the time of posting. All calories are approximate and are calculated using the My Fitness Pal recipe calculator.